There are some tricks that will get me every time. The second Freddie was so cagey about what he’d been up to in America, I knew there was a girl in the picture, and I knew he was probably married to her. I also suspected that we’d get a scene where Bel realized her feelings for him and went to his place to tell him all about it, only to meet this new girl. And while what played out was more understated than all that—in keeping with this show’s m.o.—it was still straight out of the Friends first season cliffhanger playbook. Freddie’s married to a French woman named Camille and has been for two months. And she’s played by Lizzie Brochere from American Horror Story! And when Bel finds out, her face falls, and everything hits home. The trick that The Hour plays is to blend a bunch of different kinds of shows and hope that the mixture makes a certain amount of sense. This means that there’s always at least one element that sticks out like a sore thumb (it appears to be some sort of crime narrative this season, which I imagine is leading to Hector being accused of assaulting his one-night stand), but there’s also so, so much stuff that works well. This is a series about inventing a new form of journalism. It’s a series about navigating the sociopolitical waters of the 1950s. It’s a series about an empire in decline and the citizens of that empire trying to figure out what to do with that information. It’s a series that aspires to genre storytelling for reasons I can’t quite fathom. (Seriously, there are scenes in tonight’s episode that look straight out of something like L.A. Confidential.) And, yes, it’s an impressively mounted and handsomely done melodrama, with gloriously soapy elements. I’ll be honest with you: It took me a little time and refreshing my memory about what happened in season one to remember who everybody was on the show. I knew Hector and Bel and Freddie, sure, and I remembered that season one had ended with Clarence being exposed as a Soviet spy. But I don’t know that I could have told you the names of all of the side characters without reminding myself by reading the Wikipedia page and my reviews of last season. In some ways, this is a flaw of the six-episode season that aspires to a large ensemble cast. In that small a number of episodes, it’s all but impossible to build more than a handful of characters, and one of the four the show built most successfully last season is now off the show. When you add in the fact that the series also has to introduce a new character—Peter Capaldi’s quietly authoritative Mr. Brown, the new head of news—well, there’s potential for everybody to get lost in the shuffle. The other portions of Morgan and Goldbacher’s work take us through a typical day in the offices of The Hour. In a fun opening sequence, the two quickly lay out who everybody is at the show, as Isaac is very nearly forced to go on the air in lieu of Hector, who’s out cadding about somewhere. Instead, he sweeps in at the last minute, all Dominic West charisma and charm, and he sits down with mere seconds to spare, then starts delivering the news almost perfectly. It’s a great sequence, both for how it starts the season with a jolt of energy (something season one could be lacking in at times) and for how it reintroduces us to all of the characters we might have forgotten about, like the sweetly dorky Isaac or the perky Sissy or the maternal Lix. The rest of the episode primarily concerns itself with introducing the major plot threads for the season, like the battle with ITV (which wants to sign Hector away), Hector’s growing problems with alcoholism and infidelity, and Mr. Brown’s ascension. (I should say we don’t get nearly as much Capaldi as I might like here, but knowing the man’s talent and seeing what he does with his screentime in this episode, I’m hoping for great things.) We also get the start of the police storyline, which I’ll admit is the sort of thing I’d have ignored were I not reviewing the show. It’s just so tonally inconsistent with the rest of the series that I find myself half-wondering what on Earth Morgan is thinking just tossing it in there. Granted, it’s early, and this might all pull itself together in the weeks to come, but it doesn’t get off on the best foot. Anyway, all of this table setting keeps the episode from feeling too vital, but that’s common for a season premiére, and in an episode like this, it’s just nice to catch up with all of the characters and see what they’ve been up to in the interim. And once Freddie returns—he’s now the co-host of The Hour, and his return was one of the specifications Brown made if he was going to take the job—the whole thing jolts to life in a thrilling way. If Hector is the series’ gut, the manchild who indulges all of his appetites and leaves his wife endlessly baking while waiting for him to come home, and Bel is the series’ soul, the woman who’s trying to keep a cool head even as the world burns around her, then Freddie is its heart, the idealistic one who really believes in changing the world through better information. 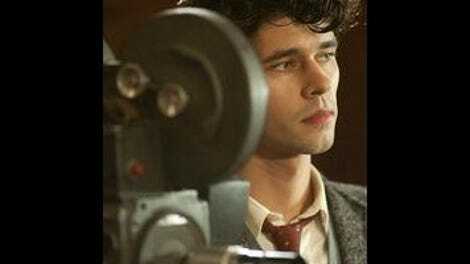 It’s a neat inverse of the usual woman:heart::man:brains dynamic you see in so many series like this, and in Ben Whishaw and Romola Garai, the series has the perfect actors to explore that dynamic. And then Bel finds out Freddie’s married, and her face crumples just a bit, and I’m in for another season. 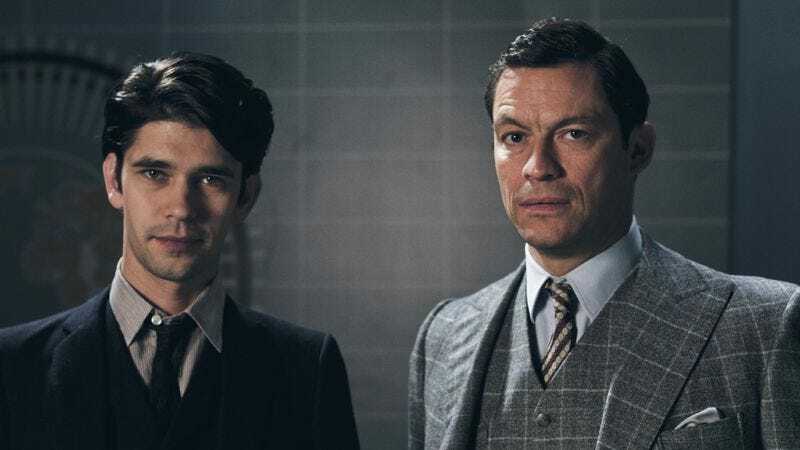 So long as this is a show about these two, with Hector playing the devil on both their shoulders, then it’s one that’s worth watching, no matter what ridiculous noir affectations it adopts. Freddie gets in some good questions at the “press conference,” I guess you’d call it, and I liked the way the secret memo paid off right away. The show would have waited several episodes to do that in season one. It’s also nice to see McCain again. I figured he wouldn’t be as prominent this time around, but it’s always nice to have his brand of blind fealty to the crown in the series’ mix. I do like the little glimpses we get of Marnie’s slowly dissolving perfect life, as well as her implication that Hector hasn’t been able to get her pregnant yet. The Madden marriage was one of the less interesting elements of season one to me, but I’m willing to go along with it this season if the series takes more time to really understand where Marnie is coming from.